(Bloomberg) -- IHOP plans to open its first location in Pakistan by the end of the year, part of the American pancake restaurant’s efforts to seek new revenue abroad. After a couple of dismal years, the chain has rebounded recently under Dine Brands Chief Executive Officer Steve Joyce, who said in a statement that international development is a major component of the company’s return to growth. 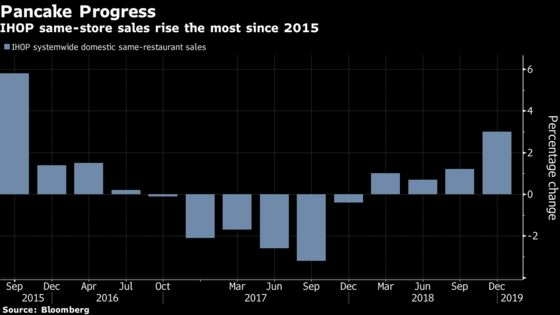 Same-store sales, a key performance metric for restaurant chains, have climbed for the past four quarters. Joyce cited Pakistan’s rapidly growing economy as part of the reason to open there. Dine Brands has already signed deals to expand IHOP into Peru and Ecuador this year, and to open more locations in Canada. The chain already has a presence in 14 countries including India, Thailand and Guam, and is exploring options in the U.K.